I am LOVING this manicure. 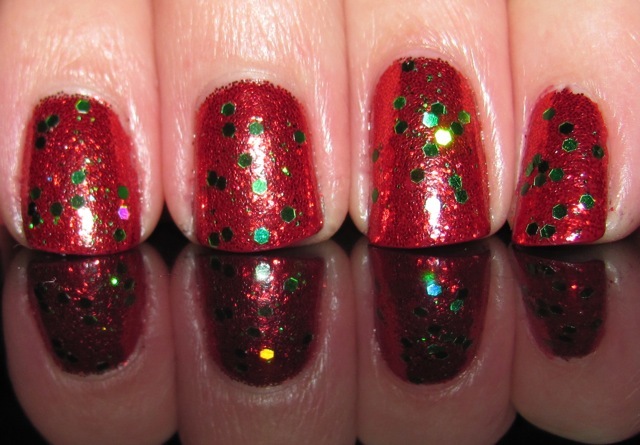 I was noticing the trend this year is both multi-sized glitters as well base glitter color with a single or dual glitter accent (think the holiday line Eye Candy, by China Glaze). I figured I could do something as good, if not better, and I think I accomplished that. I think this manicure is better in person to pick up on the red shimmer, but I'm happy with my pictures because the green really does pop IRL. I painted three coats of China Glaze City Siren and then added Green hexagonal glitter (from Esther's Nail Center) and filled in the gaps with MAC Pigment Glitter in Red. I painted one coat of Seche Vite to compliment the shine. This mani is perfect! 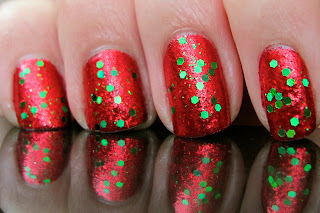 I love red and green together... these glitters are awesome! 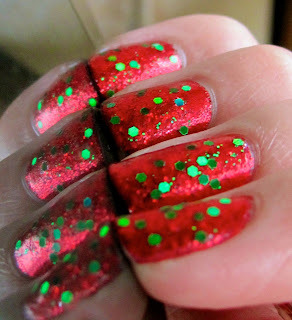 If you take a look at my blog today, you gonna see that I'm wearing two kinds of glitter (I hope that it can be noticed). Yeah, I really love this one you're wearing, superb!